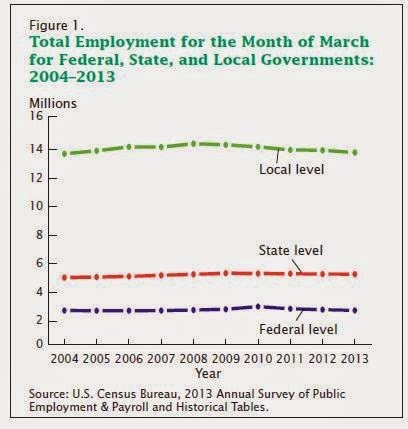 In March 2013, federal, state, and local governments employed 21.8 million people. This is a decrease of 208,851 employees (0.9 percent) from the same period in 2012. State governments employed 5.3 million people, a decrease of 4,169 (less than 0.1 percent). 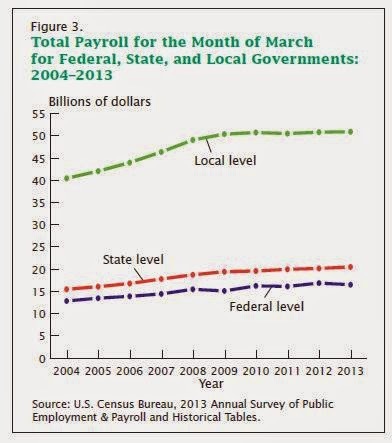 Local governments employed 13.8 million people, a decrease of 156,877 (1.1 percent). The federal government employed 2.7 million people, a decrease of 47,805 (1.7 percent) (see Figure 1). The figures do not include job stemming from grants and contracts, however.